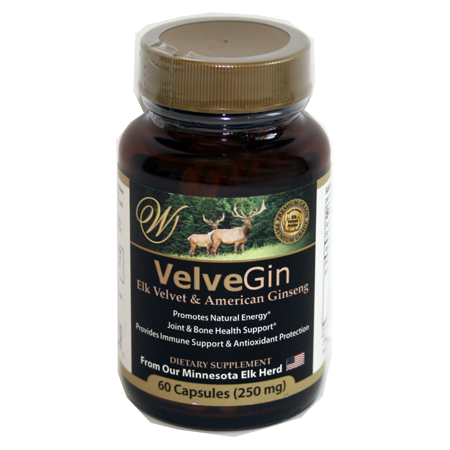 VelveFlex | Elk Velvet Antler | Wapiti Labs, Inc. Formulated for an active lifestyle. So glad I found this! After a bad knee injury that I really didn’t have the time off for surgery but had to keep working I was desperate and had a hard time even walking. A good friend had told me how much the dog version helped her dog I figured it might help me & called to get some & make sure it was safe for me to take. I was informed that there was a people version, so I ordered some for my dog Tux and this for me. It didn’t fix things overnight, but I could tell it was helping. A few months later when I was in the clear and realized it might be the VelveFlex at work, I was struck in the knees, re-injuring my left and royally messing up my good right knee. I’m the sole bread winner for my family and no way I have the time off for a knee job and physical therapy ( at least $10,000 and probably $20,000 plus lost wages). I went from screaming when walking & driving to nearly normal in just over 3 months! I’m not going to be without this! I have been injured a lot in the past & haven’t bounced back this fast. I really attribute it to the VelveFlex. Splits are great for softer chewers or dogs not familiar with elk antler products. Dogs love to have full access to the marrow in the middle of the chew! Typically not as long lasting as our whole antler chews.